My husband Michael went to Santa Barbara’s Cottage Hospital early this morning. (The cause was a sudden infection related to a chronic illness. He was in pain, had a fever and was feeling horrible. It was scary.) We waited in the ER for many hours during which he was poked, palpated, CT-scanned, you name it. It was 4 o’clock by the time they finally admitted him and put him in a semi-private room. No, his roommate wasn’t Jack Nicholson or Morgan Freeman, but the guy was sound asleep when Michael arrived – a blessing. I’ll make this short, because it’s been a long, depressing day, but I just had to share a funny light at the end of the tunnel. (No, it has nothing to do with Damon. And yes, I read that Nady went to the Cubs.) As I was trying to cheer Michael up, his nurse walked in and introduced herself. When I remembered I had the She-Fan Cam in my bag, as I always do, I asked if she would let me record her. I know, I know. I was in my husband’s hospital room, not at a baseball game, but I pressed on anyway. Imagine my surprise when – without any prodding whatsoever – she turned out to be a Yankee fan. She got my husband to laugh and she reminded me that the pinstripes appear when you least expect them to. Here she is in her own words. Actually, the water does boil, even if you stand there watching the pot, but the idea is to stop hovering while you’re waiting for something to happen and just let it be. So that’s my new strategy regarding the Yankees. I’m going to stop reading everybody’s opinions about who should play left field and just let the situation play out. Jason Bay is out of the picture. Matt Holliday is probably out of the picture. Boras wants more for Damon than the Yankees want to spend. Nady has had two Tommy John surgeries. And Reed Johnson, Scott Posednik and Jonny Gomes don’t inspire blog posts. Brett Gardner could still get the job, but didn’t I just say I was through speculating? Enough about this subject! I’m done, I tell you. When the Yankees have something to announce, I’ll write about it then. But there will be a moratorium on all discussion of who will play left field in 2010 starting RIGHT NOW! Instead, has everybody seen this mashup of the top ten songs of 2009? I don’t hear/see “Empire State of Mind” anywhere, but maybe I’m missing something? I need the interlocking N-Y or I’m not happy. How Many Outfielders Does It Take To Screw In A Light Bulb? Or, to put it another way, how many outfielders will make the Yankees’ Opening Day roster? Now that we’ve added Jamie Hoffmann, the Rule V Draft Pick who was half of the Bruney-to-Nationals deal, we have five – count ’em, FIVE – viable outfielders. And that doesn’t include Damon, who could still sign, plus one or two Hinske/Hairston utility types yet to be on our radar. Sounds like a game of musical chairs to me. While it’s true that you can never have too many options, given possible injuries (hello, Xavier Nady) and mediocrity (that would be you, Shelley Duncan), the Yankees have some decisions to make and one of these guys is bound to get left out. Let’s look at the outfield as it stands tonight…. He looks awfully snappy in his newly Photo Shopped cap and uniform, doesn’t he? Obviously, he’s not going anywhere. I hope he patrols center field for a long, productive time. The presumed right fielder who started his Yankees life as our presumed first baseman before Tex came along and Nady went down, Swish has a decent arm, gets on base (except when he strikes out in key situations) and lightens up the clubhouse. He can also turn a routine fly ball into an adventure, and performs needless somersaults. Gardy, not to be confused with Grandy, runs like crazy, as we all know, and covers a lot of ground in center. His arm won’t blow anyone away. But if he gets on base, his speed causes the opposition to spazz out. The word “if” is key here. He doesn’t get on base often enough. The new kid looks a lot like the old kid (Shelley). Apparently, Hoffy played a lot of hockey and was even drafted by the NHL. According to Mark Feinsand of the Daily News, Cashman said of Hoffman: “He’s got a hockey mentality – a very athletic and hard-nosed outfielder.” I guess that means he’ll be good in brawls? There they are – five candidates for three spots – with the possible addition of Damon. So who gets traded? Anybody? Hoffy could do time in Scranton. And The Melkman and Swishalicious could handle the corners. But where does that leave Gardy? There’s no one more fun to watch on the base paths. I know this will seem like I’m just echoing my post from last night about Joba/Hughes, but can’t we keep every single one of them? Right now all I want to do is hoard players. Isn’t that only natural in winter? He threw 98 mph. He didn’t walk a single batter. And he struck out eight en route to the Yankees 9-1 victory over the Mets. He also had an RBI single and scored during the Mets’ error-filled meltdown in the second. I could feel the ground shake as he chugged home. He’s as big as The Fridge, isn’t he? Anyway, it was a masterful performance, marred only by Sheffield’s blast, and I hope he doesn’t catch the bug that claimed Jeter, the birthday boy, who was scratched from the lineup with a bad cough. Other than CC, the hero of the night was Brett the Jet, who is insanely fast and could probably win a race with this guy. Five-for-five with a homer, a triple and a stolen base? How hug-worthy was that? Damon continued to excel (great dive/slide on that catch of Cora’s pop up in the first). Cano played good ball in spite of his various ailments. And Pena had a couple of doubles, subbing for Jeter. But how about A-Rod. He’s looked like a different player in the last few games. Maybe it’s the day off he had during the week or the hip that’s finally healing or the fact that Kate Hudson is following him around the country and bringing him luck instead of jinxing him. All I know is he made several nice plays at third and passed Reggie on the all-time home run list. I wonder why the Mets’ defense goes all loosey-goosey when they face the Yanks. That second inning was like a bloopers reel. Maybe it’s because of their lame old theme song. Here’s Bob Costas singing it. Not good at all. P.S. I’m sad about Nady. I thought he’d have a big year for us. And now he’s done. Goodbye, X-Man. It was fun while you lasted. #1) I wouldn’t have gotten to see today’s Yankees-Angels finale even if they’d played it. Why? Because I was blacked out. Not just on regular TV but on MLB.TV too. BLACKED OUT. What was the deal? I live in California. I get all the Angels games on the local Fox Sports channel. But today, for some inexplicable reason, the baseball gods decided to issue a blackout restriction. Am I not paying enough for my Extra Innings package, my Cox cable, my MLB premium, my everything? It absolutely infuriated me. #2) The rainout means Nick Swisher will have another day to rest his sore elbow. I admit I wasn’t one of his early supporters. I’m a Nady person. But Swish won me over (he had me at: “Sure, I’ll pitch”) and I miss not seeing him and his bat in the lineup everyday. #3) The rainout today also means I didn’t have to watch Angel Berroa play third. Girardi had him slated to go instead of Pena, and An-hell’s error-prone defense could have been contagious and led to a whole lot of slipping and falling. #4) Back to Nady. 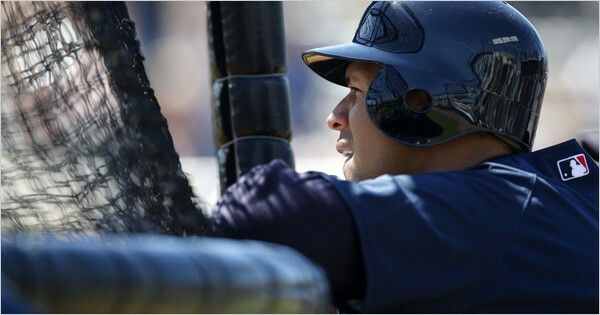 He is undergoing a medical procedure that could return him to the Yankees lineup much sooner and without surgery. According to Peter Abraham, he’s having “platelet-rich plasma injected directly into the area around the torn ligament in his elbow.” Ouuuwww. #5) Just wondering: Who pays for Nady’s procedure, A-Rod’s hip surgery and the countless MRIs that players undergo as routinely as they take batting practice? Do the Yankees foot the bill for all this stuff? The players themselves? The players’ union? All I know is that Cigna, my health insurance company, gives me a hard time if I even look at my doctor. #6) I wasn’t going to get into Selena Roberts’ book about A-Rod, but since the game was rained out I might as well. If MLB needs to investigate whether he used steroids as a Yankee and/or if he tipped pitches while in Texas, they should go for it and, if he’s guilty, give him the Pete Rose treatment. But seriously. How will Bud and his investigators ferret out the “anonymous sources?” It could be a challenge, given that Roberts herself won’t cooperate. What I truly don’t care about is what A-Rod may or may not have done when he was a kid. For all I know he’s the most unpleasant, selfish, needy, womanizing man on the planet. But unless he’s done something that requires discipline from MLB, I refuse to act like he’s…..this guy. (Daily Flip Video Contest Reminder) I’m getting some really great pix!